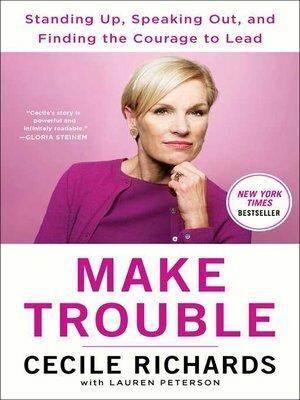 From Cecile Richards, the former president of Planned Parenthood for more than a decade, daughter of the late Ann Richards, featured speaker at the Women's March on Washington, and "the heroine of the resistance" (Vogue), comes "an enthralling memoir" (Booklist, starred review) filled with "practical advice and inspiration for aspiring leaders everywhere" (Hillary Rodham Clinton). Cecile Richards has been an activist since she was taken to the principal's office in seventh grade for wearing an armband in protest of the Vietnam War. Richards had an extraordinary childhood in ultra-conservative Texas, where her civil rights attorney father and activist mother taught their kids to be troublemakers. She had a front-row seat to observe the rise of women in American politics and watched her mother, Ann, transform from a housewife to an electrifying force in the Democratic party. As a young woman, Richards worked as a labor organizer alongside women earning minimum wage, and learned that those in power don't give it up without a fight. She experienced first-hand the misogyny, sexism, fake news, and the ever-looming threat of violence that constantly confront women who challenge authority. Now, after years of advocacy, resistance, and progressive leadership, she shares her "truly inspiring" (Redbook) story for the first time—from the joy and heartbreak of activism to the challenges of raising kids, having a life, and making change, all the while garnering a reputation as "the most badass feminist EVER" (Teen Vogue). In the "powerful and infinitely readable" (Gloria Steinem) Make Trouble, Richards reflects on the people and lessons that have gotten her through good times and bad, and encourages the rest of us to take risks, make mistakes, and make trouble along the way.